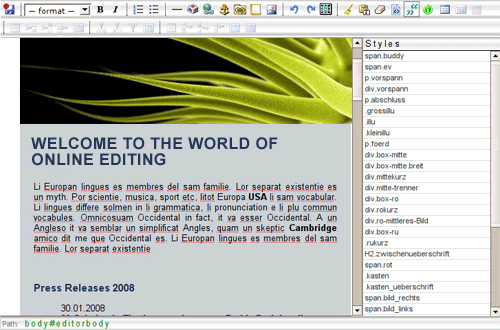 Xinha (pronounced like ​Xena, the Warrior Princess) is a powerful WYSIWYG HTML editor component that works in Mozilla based browsers as well as in MS Internet Explorer. Its configurabilty and extensibility make it easy to build just the right editor for multiple purposes, from a restricted mini-editor for one database field to a full-fledged website editor. Its liberal licence makes it an ideal candidate for integration into any kind of project. Yes, ​here it is. Please don't post bug reports, feature requests or patches in the forum, use the ​Ticket System for that so we can track them more efficiently.